The IEA issued two important reports in late 2016, brief overviews of which are provided below. 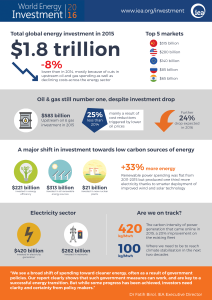 What was the level of investment in the global energy system in 2015? Which countries attracted the most capital? What fuels and technologies received the most investment and which saw the biggest changes? 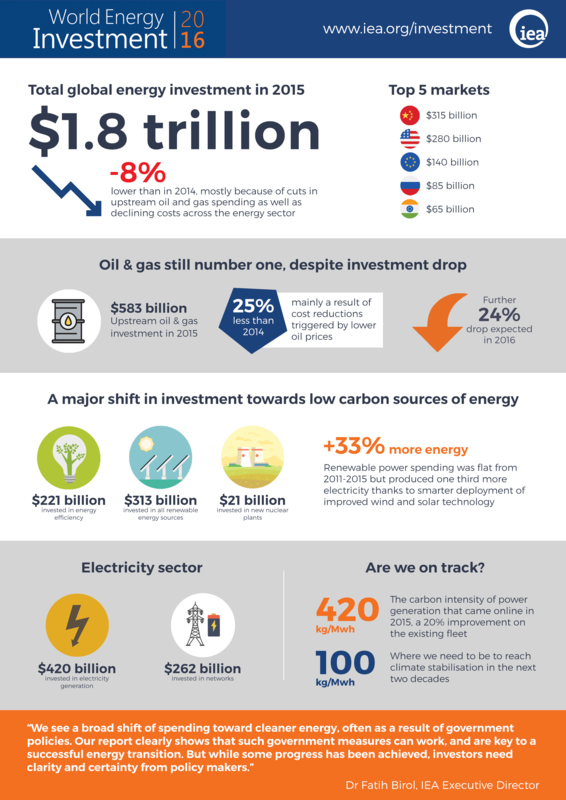 How is the low fuel price environment affecting spending in upstream oil and gas, renewables and energy efficiency? What does this mean for energy security? 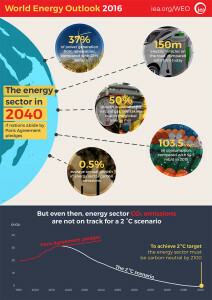 Are current investment trends consistent with the transition to a low-carbon energy system? How are technological progress, new business models and key policy drivers such as the Paris Climate Agreement reshaping investment? At this link, you also can order an individual copy of the complete report for a price (between €80 – €120). The IEA issued their report, “World Energy Outlook 2016,” in November 2016. The report addresses the expected transformation of the global energy mix through 2040 as nations attempt to meet national commitments made in the Paris Agreement on climate change, which entered into force on 4 November 2016. At this link, you also can order an individual copy of the complete report for a price (between €120 – €180).